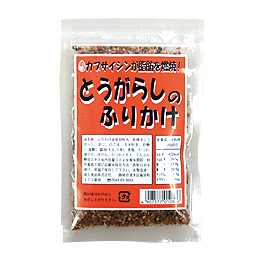 Fragrant spicy spicy dry red pepper based upon sprinkle is. ○ sprinkled to taste with hot rice and served. 1 rice sprinkled with rice, red pepper aroma appetite arouses. 1 moderate amount of peppering fluent is hot. ）, rice germ (made in Japan), brewed soy sauce （ soybean and wheat gene pairs.